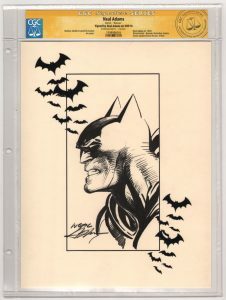 This stunning original art sketch features the pencils and inks of Neal Adams. It is certified authentic by CGC as part of their special Signature Series. With CGC’s Signature Series, a certified witness actually observes the signing/sketching and then immediately takes possession of the collectible so there is no chance for the real autograph/sketch being replaced or substituted. It measures approximately 8 1/3 by 11 inches (the CGC plastic protective sleeve it is encapsulated inside measures approximately 9 3/4 by 13 inches… scanner cuts off a little of the right side of the plastic sleeve), is in excellent condition and will be shipped with the utmost care.